The Buttercream Project part 4 | "blackberry-eating in late September"
Yes, the dissertation is complete. 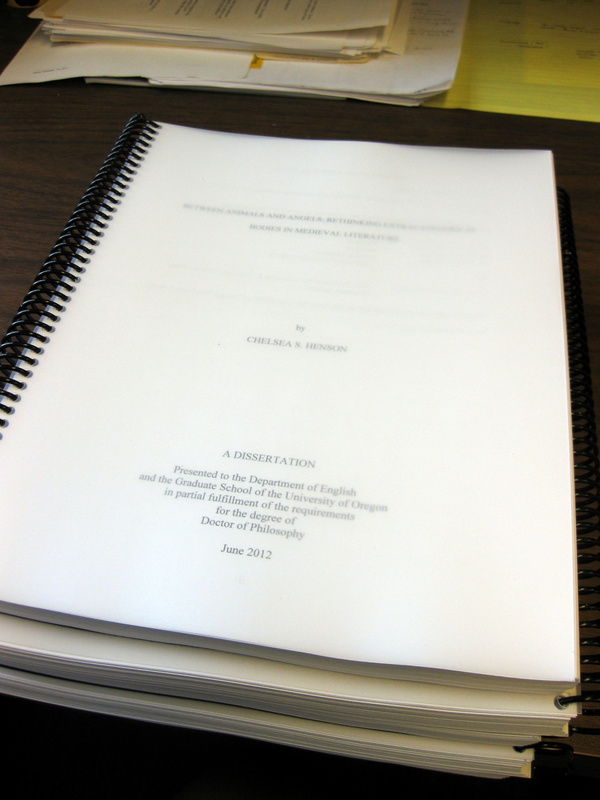 Well, it’s complete in the sense that I’ve distributed it to my committee. Three weeks from now – three weeks from yesterday, actually – I will defend it. But in the meantime, cupcakes! 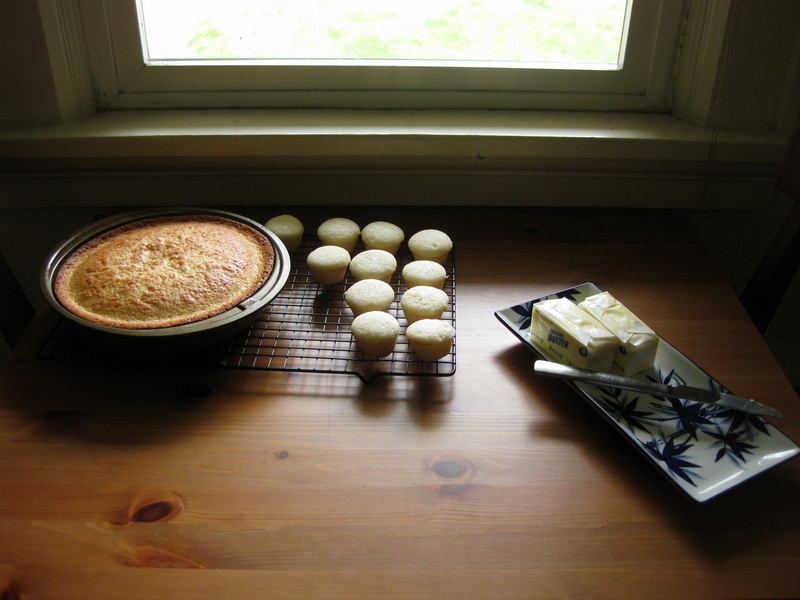 Cake flour makes the most delicate, light, bakery-style cake. It’s worth the extra cost. 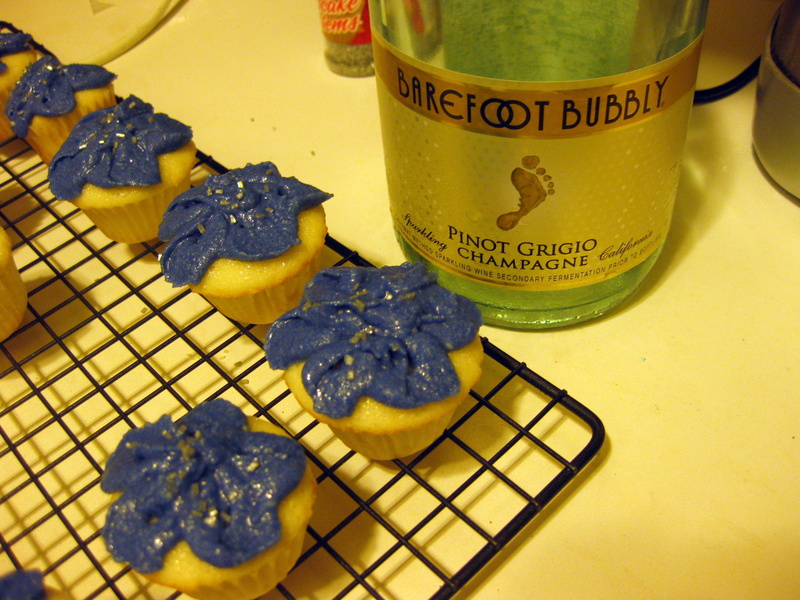 Barefoot’s Pinot Grigio sparkling wine is a good choice for cake; it has a crisp brightness and is strong enough to stand out as a distinct flavor once the cake is cooked. Buttercream sometimes looks like it’s going to fail, but then you just continue to whip it and it comes together. This round, I did champagne cake with a mascarpone and apricot jam filling, and mascarpone buttercream. I wanted to try a full sized cake so I could practice getting the frosting nice and smooth. My assessments: the cake was perfect. It smelled good, it tasted good, it had a moist crumb with a slight squish between the teeth – excellent eating. Cornelli lace all over the top is really quite pretty, but not too twee or too formal. The filling was… okay. Tasty, but not perfect. I think the jam with the mascarpone added too much richness to an already rich product. Perversely, I think this particular filling would be better with a chocolate cake. It would be a contrast in both color and flavor that simply wasn’t present here. J. and H. liked it, and of course their vote is most important, but I wasn’t satisfied yet. The buttercream, my nemesis, was almost a disaster. I made a big batch of frosting, because I wanted to frost the full cake and practice making flowers on the mini cupcakes. I bought myself a petal tip from Michael’s and was itching to try it out. This time, it would have to be perfect. Here’s the thing, though. When you double the amount of fat in a frosting, you also have to double the amount of sugar! As I whipped together a cup of butter and a cup of mascarpone cheese, and as I added cup after cup of powdered sugar, things were not coming together. No, in fact things were starting to separate. 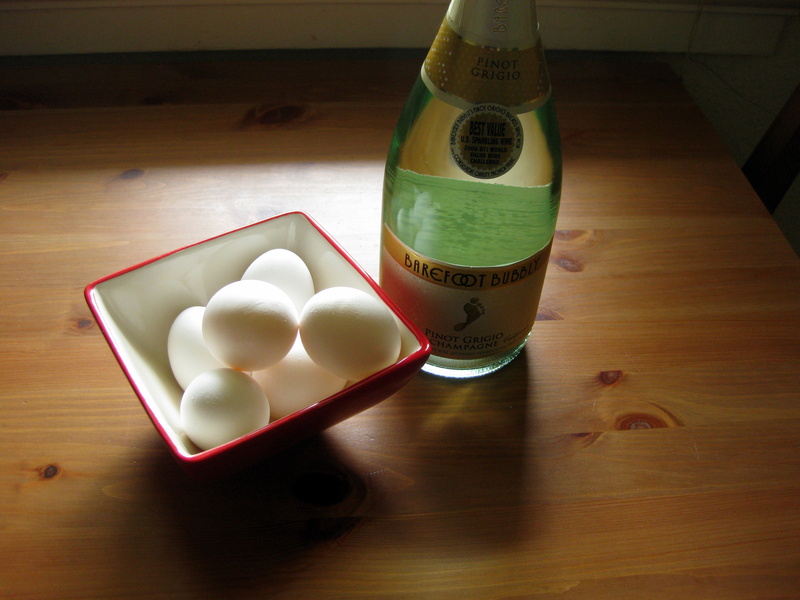 A pool of liquid formed as the clumps of butter and cheese turned into strange creamy granules instead of an even mass. I started to fret. I got a little scared. This was NOT how this round was supposed to go. And then, logic and revelation triumphed over fear. Maybe the fat was too warm. Yes, it was melting in protest. I stowed it in the fridge for twenty minutes or so. As I added more sugar, things got a little better. As I added more sugar, it started to smooth out. And then after my final addition, I let the mixer rip for a good minute or two, and magic happened. The frosting smoothed and softened and became this delicious creamy cloud. My lungs heaved relief. The moral of this, apparently, is: if your buttercream isn’t perfect, add more sugar and beat it longer. Whip the resistance right out of it. 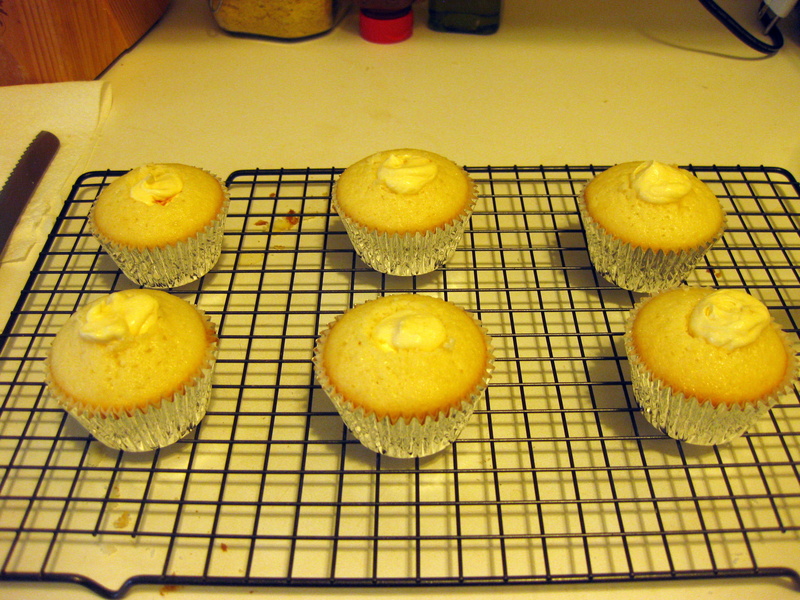 Despite the improved texture and the excellent flavor, my frosting attempts were still imperfect. The swirls I put on the full size cupcakes threatened to topple over the delicately curved hills onto which I optimistically piped them. They still looked nice, but the edges and ripples weren’t sharp, and I shoved them into the refrigerator before they had time to break down any further. The mini cupcake flowers were another fresh learning experience. I tried. Oh I tried. I watched the video twice and followed it exactly, and again, the petals were thick and dull. They looked more flower-like than my previous attempt, but they weren’t the beautiful fluted edges Alice achieves with such ease. Nevertheless, for me, improvement is improvement. Progress counts. This was the best so far, and just needed some minor (I hoped) adjustments to make it wedding-worthy. It’s a good metaphor for my own progress, really. Even the best work can stand improvement. Let’s hope my revisions, as I note them, are as minor as tweaking a frosting method. Flute the edges. Visit the thesaurus. Adjust a sentence or two. Or five. Add powdered sugar. Enjoy. Aren’t these things, at their heart, not so different? Let’s hope so. 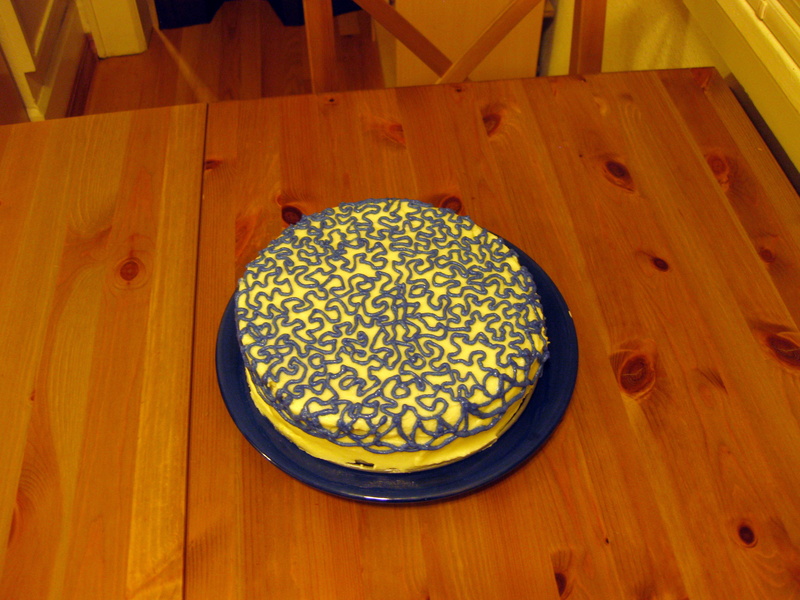 This entry was posted in Baking, Bibliophilic, Cake, Cheese, Dairy, Desserts, fruit, party food, Sweets of sin, vegetarian, Wedding by Chelsea. Bookmark the permalink. Thanks so much! I’m still a piping novice, but I feel I’m slowly improving.